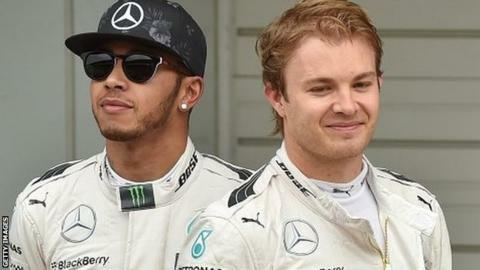 Nico Rosberg says he has not given up hope of beating Mercedes team-mate Lewis Hamilton to the Formula 1 title going into Sunday's Russian Grand Prix. Rosberg, who finished second to Hamilton last time out in Japan, trails the defending champion by 48 points with five races left this season. Mercedes lead Ferrari by 169 points in the constructors' championship. "I'm not backing down and in my mind it's not over yet," Rosberg, who is 11 points ahead of Sebastian Vettel, said. Second-placed Rosberg has won three grands prix this season to Hamilton's eight, and added: "The gap on Lewis is quite big. "But the way the whole team has performed this year - from the factories to the garage - has been just incredible. I have the car I need to get back to the top step." Hamilton led Rosberg home in Russia last year to clinch the 2014 constructors' title for Mercedes.